** Is Trump Ready to Dump Pakistan? Two recent investment and technology related developments revealed the current dilemma and contradictory impulses of the United States and Europe in dealing with the economic, technological, political and security challenges from an increasingly assertive China. Last year witnessed a nadir in India–China relations as the two neighbours stumbled into their most serious border crisis in decades. While both leaderships were sensible enough to pull back from the brink, 2018 has seen steps from Delhi and Beijing to turn the page on their deteriorating relationship. As I have previously suggested in this column, the Doklam crisis showed the limits of confrontation in an age of interdependence (Z D Singh 2017). Last year witnessed a nadir in India–China relations as the two neighbours stumbled into their most serious border crisis in decades. While both leaderships were sensible enough to pull back from the brink, 2018 has seen steps from Delhi and Beijing to turn the page on their deteriorating relationship. As I have previously suggested in this column, the Doklam crisis showed the limits of confrontation in an age of interdependence (Z D Singh 2017). Yet, to address some of their underlying differences, India and China still need to engage in a more purposeful dialogue on the issues that have generated an adversarial rivalry. And, the maritime spaces connecting the subcontinent to East Asia are an appropriate issue for such a conversation. India will have to reduce the number of public sector banks either through mergers or by downsizing in the coming one or two years. It does not need 21 government banks; seven or eight should be more than enough. If there is one good reason why public sector banking should be shrunk, it is this: the bigger the share of government players in any industry, the slower the pace of consolidation and improved efficiency. Take the case of the telecom industry, where the public sector’s share is less than 10 per cent today. Barely 18 months after the launch of Reliance Jio with a super-competitive price offer, four major players crashed out (Tatas, Aircel, Telenor, Reliance Communications). A fifth has dived into the arms of a competitor for safety, with Idea merging with Vodafone. Despite a long list of anti-trade moves by successive Indian governments, there are some voices within the government that make thoughtful and compelling arguments for international economic integration. Two such groups recently released reports, covering the auto industry as well as India’s adoption of standards. Such voices must be augmented, for within their policy recommendations lie the only true prescription against the rising tide of protectionism—and for international success of the “Make in India” initiative. As countries around the world abandoned nuclear power, China had bucked the trend, embracing nuclear power as a reliable and cheap energy source that would help reduce air pollution from burning coal. 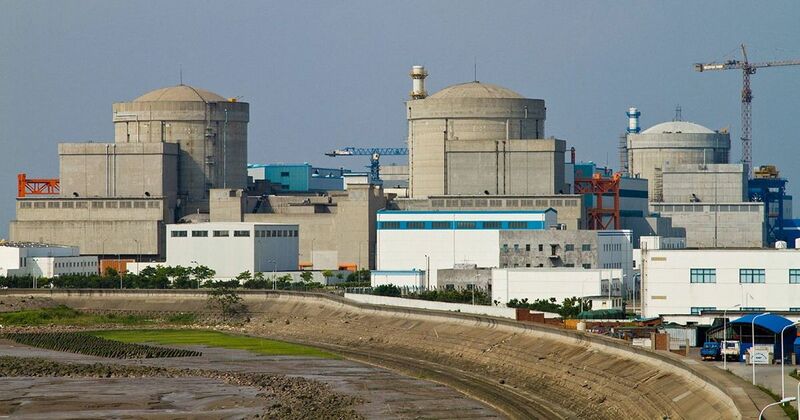 Now nuclear development in China is floundering, with the overcapacity in the power sector and fierce price competition with solar, wind and hydropower. Wider concerns about safety and lack of water (of which nuclear power plants demands a huge amount) also play a part. On 26 February, the Taurus docked at pier 3 in Greece’s rebuilt port of Piraeus. At nearly two hundred thousand tons, the ship is longer than four football fields and capable of carrying 20,000 of those familiar 6 meter containers. It is the largest ship ever to dock in a country known for its shipping prowess, and, in fact, the largest ever to dock anywhere in the Mediterranean. The goods being transported, the ship itself, the departure and arrival ports are all built, owned and run by China. Chinese investment into Piraeus has catapulted a relatively sluggish port into one of the top destinations for transporting goods to Europe and, coincidentally, produced a 92 per cent increase in the port’s operating profits in 2017. A half-billion-dollar expansion of port facilities is planned by the Chinese-run port authority. It has long been recognized that the closer alignment between Moscow and Beijing that goes back nearly three decades now provides each with ample political and diplomatic benefits. A less well explored aspect of the relationship could examine how these partners learn from one another in various domains, including in the crucial area of strategy. I have pointed out in this forum beforethat Chinese strategists have looked carefully at the war in Ukraine and the related Crimea annexation. This edition of Dragon Eye takes a close look at a Chinese assessment of Russia’s military intervention in Syria. As China grows more powerful, it is displacing decades-old American preeminence in parts of Asia. The outlines of the rivalry are defining the future of the continent. We asked a panel of experts how they think the power has shifted in the past five years: Many countries are shifting toward China and away from the traditional American-led order. Last week, a group of 11 nations signed a trade deal that had originally been conceived as an American-led counterweight to China — but after President Trump pulled out, the pact went forward without the United States. It was the latest turn in Asia’s gradual transition from American dominance to something much more fluid. The stakes could hardly be higher: The two powers are seeking to reshape the economies and political systems of the world’s most populous region in its own image. How Can the U.S. Avoid a Trade War with China? The U.S. move last Thursday to slap tariffs on $60 billion worth of imports from China could escalate into a trade war in which there will be no winners, according to experts at Wharton and elsewhere. The U.S. move drew a swift reaction with China on Friday announcing tariffs on some $3 billion worth of imports from the U.S. Financial markets worldwide lost value last Friday, but eased somewhat on Monday morning after signs that the U.S. and China could hammer out a negotiated settlement. The Wall Street Journal reported Monday that China’s newly appointed vice premier and so-called economic czar Liu He, U.S. Treasury secretary Steven Mnuchin and U.S. trade representative Robert Lighthizer are leading the talks. The U.S. side is asking China to cut tariffs on American automobiles and buy more U.S. semiconductors, among other demands, the report said, adding that Mnuchin may soon visit China. Since the 1970s , Jihadist violence which appeared in Egypt and in the broader Arab region has undergone various transformations, including broadening its targets and expanding the scope of its operations. Understanding those dynamics is key to develop efficient approaches to tackle new forms of violent extremism that would go beyond the security focus. This paper examines the key factors that have driven the transformations of extremist groups in the past five decades, through an analysis of the narratives developed by the first generation of violent extremist organisations, exemplified by al-Jihad and al-Jamaa al-Islamiya in Egypt, and the second wave (al-Qaeda and ISIS). The paper also maps new violent groups in Egypt, especially some that broke away from the Muslim Brotherhood and started promoting violence. 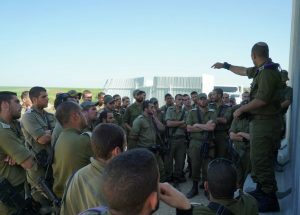 EXECUTIVE SUMMARY: Military drills simulate what the Israel Defense Forces will face in a new kind of ground combat in Gaza – a kind that will inevitably involve civilians amid general chaos. After Hamas came to power in the Gaza Strip more than a decade ago, it built, trained, and armed a terrorist army and guerilla force. It deliberately situated these forces in the midst of the civilian population, planting it in high-rise buildings, underground bunkers, and tunnels.Israel and Hamas have engaged in three large-scale conflicts and numerous smaller-scale flare-ups over the past ten years. As the IDF looks to the future, it is preparing new ways to operate in this urban jungle should the need arise once again. Before he was the national-security adviser, he wrote a lacerating account of generals who failed in advising Lyndon Johnson. What will he say now that he is free to talk about Trump? “They have their exits and their entrances,” wrote Shakespeare, and so it is, as we see some actors deliver frantic speeches while others leap, slide, or crawl on and off the foreign-policy stage. Kim Jong Un May Be in China. What Does That Mean for Trump? The Nikkei Asian Review states that a dignitary rode in a convoy to the Diaoyutai State Guesthouse and additional guards were posted at the Great Hall of the People, which is where Chinese leaders traditionally meet their counterparts. BBC China correspondent Stephen McDonell, among others, has been tweeting about the commotion in the Chinese capital surrounding the surprise visit. If Kim was on the train—and there is no confirmation as of yet from China’s Ministry of Foreign Affairs—then it would be his first known trip outside of North Korea since assuming power in December 2011. Robert Collins, a veteran Pentagon advisor who has worked with U.S. Forces Korea, speculated in comments to the National Interest that if Kim was not on the train, then China’s high-profile visitor might instead be Kim’s increasingly prominent sister, Kim Yo-jong. Revelations about Russian cyberattacks on the U.S. energy grid are sparking new fears in Washington about the growing threat to the energy sector. The developments have some officials worried that Moscow or another nation state could execute a disruptive cyberattack targeting the U.S. power grid. "The next Dec. 7 won't be airplanes and torpedoes coming at Pearl Harbor, it's going to be triggered with an attack on our energy grid with rolling blackouts and chaos," Rep. Don Bacon (R-Neb. ), a member of the House Homeland Security Committee, said this week. On March 15, the Department of Homeland Security together with the FBI announced that Russian government hackers infiltrated critical infrastructures in the U.S.—including “energy, nuclear, commercial facilities, water, aviation, and critical manufacturing sectors.” According to the DHS-FBI report, malicious Russian activities have been ongoing since at least March 2016. The Russian malware, which has been sitting in the control systems of various U.S. utilities, allows the Russians to shut off power or sabotage the energy grids. And they have done it before: The same malware that took down Ukraine’s electrical grid in 2015 and 2016 has been detected in U.S. utilities. The potential damage of a nationwide black out—let’s say on Election Day—would be significant, to say the least. And while Russian trolls and bots have captured public attention, they are already yesterday’s game. As I write in a recent Brookings paper, the future of political warfare is in the cyber domain. How Will Trump Punish Russia Next? In national security, punishing people can be an art form. Figuring out the right tool to use—and how high to raise the volume in response to bad behavior—takes a lot of careful thought and analysis about what really matters to your target and what your own end goal is. 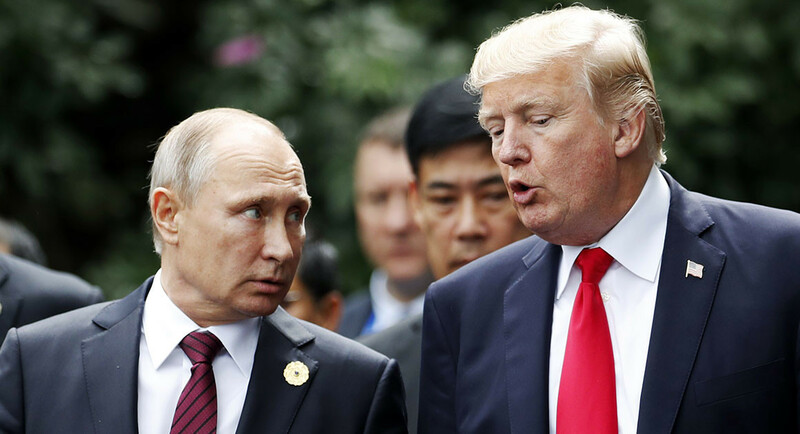 The U.S. announcement—which followed similar announcements from several other countries—that it will expel Russian diplomats and shutter the Russian consulate in Seattle in response to a Russian chemical weapons attack on British soil was likely the result of careful deliberation. There are lots of assessments of national digital maturity. Bhaskar Chakravorti, Ajay Bhalla and Ravi Shankar Chaturvedi published an excellent article on digital competitiveness in the Harvard Business Review where they indexed 60 countries’ digital competitiveness. IMD developed World Digital Competitiveness rankings which yielded ten “winners”: While these countries are deservedly proud of their rankings, they should also be fearful: the greater a country’s digital maturity, the greater its vulnerability. This simple equation makes the US, the UK, Japan and other digitally competitive countries far more vulnerable to cyberwarfare than those that are digitally underdeveloped. This irony is not to be discounted. Samantha Bradshaw and Phil Howard have a new report, published as a white paper in a series on media and democracy commissioned by the Knight Foundation. 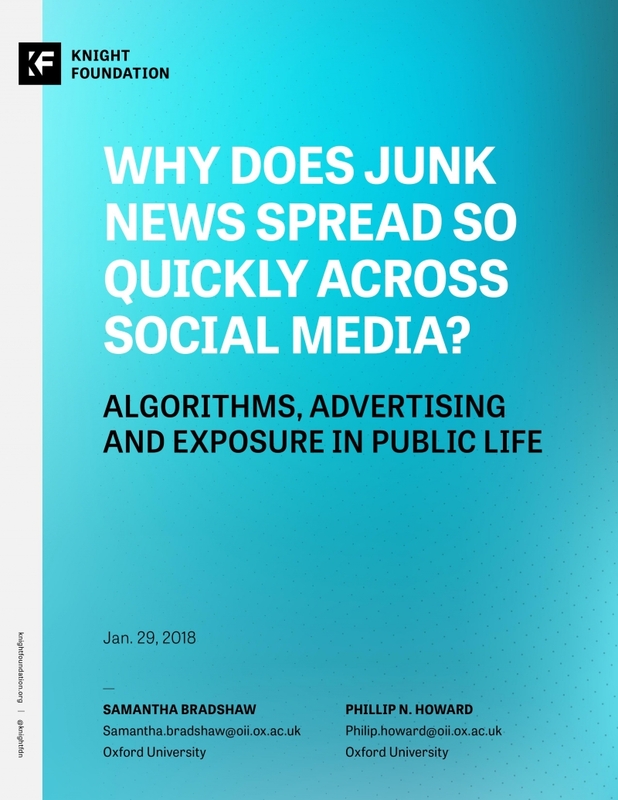 This white paper explores the spread of junk news around the world. It begins by examining the relationship between social media and democracy. The second section explores what happened during elections in 2016 and 2017, and how conspiracy theories, polarizing content, and Russian sponsored ads simultaneously flooded the social media ecosystem and microtargeted users. 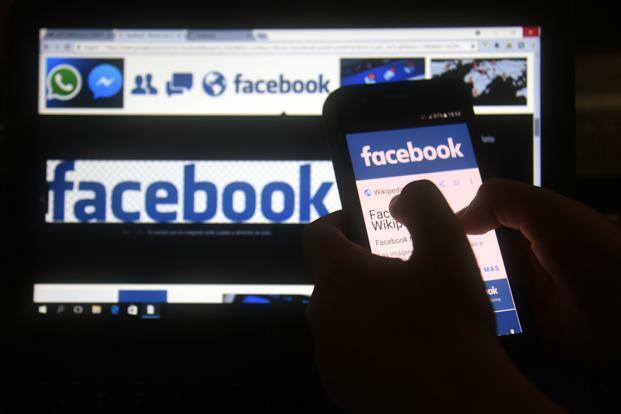 The third section discusses the role of algorithms, advertisements and selective exposure in filtering and delivering content. This white paper concludes with some ideas for how social media platforms should design for democracy and how governments should regulate. Indictments and sanctions the Justice and Treasury departments handed down against an Iranian business and a handful of hackers Friday were about more than just meting out punishment, Deputy Attorney General Rod Rosenstein stressed repeatedly. Rosenstein’s big message: These sanctions and indictments will deter future cyber theft by Iran and other countries. “Our work on this case is critically important because it will disrupt the criminal operations of the Mabna Institute and deter similar crimes by others,” Rosenstein said, referencing the Iranian organization that U.S. officials say orchestrated $3.4 billion in cyber thefts from 144 U.S. universities and 176 foreign universities, among other victims. SATELLITE DISHES MARK the main gate of Fort Gordon, eggshell white and lasering up at the moon. It’s a modest shrine, as these things go. Many military bases put machines of might on the front porch—tanks or helos or jumbo artillery guns—but the dishes fit Fort Gordon just fine. They’re subtle. They’re quiet. Inside the gates it’s more of the same. Fort Gordon sits in a soft Georgian basin, the traditional home of the US Army Signal Corps. Signal has been around since the Civil War and has long been responsible for military communications—flags and torches back in the day, radios and cables and mesh networks in the more recent past. Recently, this staple of warfare started sharing its digs with a new branch: cyber. Find the right Signal old-timer, maybe one feeling cranky or deep in their cups in a bar along the dark Augusta riverfront, and they’ll talk candidly about this new branch. They say it with envy, and sibling affection. Still, though. They say it. Over the course of seven years of war, the Syrian Arab Army (SAA) has engaged in armed conflict against various opposition forces composed of domestic rebels and foreign volunteers, often equipped with light weapons. Given the sheer amount of open source information available related to these events, it is possible to track the military vehicle losses of the SAA — an army which once had the 6th largest number of tanks in the world. Before outlining the armoured tracked vehicle losses that can be confirmed by visual evidence (photos and videos), the methodology of collecting the information will be examined. The article ends with a discussion on the reasons why the SAA may have lost so many armoured tracked vehicles. Unlike the Taliban, Russia and China can shoot down our drones, jam our transmissions, and hack our computers. So to prepare to fight them, we need a very different communications network — one the US Army is now studying how to build. Installing a jamming-resistant antenna on an Army Stryker vehicle inside a massive anechoic test chamber. The revolution in warfare will not be televised. In a future great power conflict, American command posts won’t have the live video feeds our officers got accustomed to in Afghanistan and Iraq. Unlike the Taliban, Russia and China can shoot down our drones, jam our transmissions, and hack our computers. So to prepare to fight them, we need a very different communications network — one the US Army is now studying how to build.